I’m pleased to let you know that this Thursday is the first all-candidates event of the campaign. I say “event,” because this is decidedly not a straight-forward debate. Instead, my opponents and I are told we will “have to work with and against each other in a series of game show–inspired challenges that test civic knowledge and comprehension.” In other words, it should be a fun night, in addition to being informative. 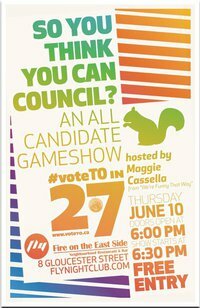 Hosted by Maggie Cassella, “#VoteTOin27: So You Think You Can Council?” takes place this Thursday June 10th at Fly Nightclub (8 Gloucester St). Doors are at 6 p.m., with the program starting at 6:30 p.m. The event is free, but in order to ensure admission it’s recommended that you RSVP for free tickets by clicking here. This summer, Claire and I will bike from Toronto to Montreal as part of the Friends for Life Bike Rally to raise money for the Toronto People With AIDS Foundation, which provides support for men, women and children living with HIV/AIDS. In order to participate, however, we need to reach our ambitious fundraising goals. That means that every donation will count, big and small. And we’d really appreciate your support. This is the first public announcement of our donation pages, so you could be first! Hurry! You’ll receive a tax receipt for any donation over $20, and I’ll also be super grateful.